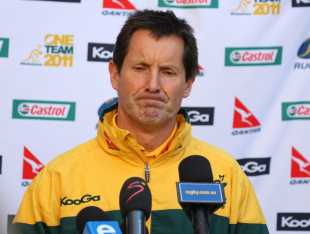 Australia coach Robbie Deans has urged his players to forget their recent purple patch of form against the Springboks ahead of their World Cup quarter-final on Sunday. The Wallabies have won five of the last six meetings between the Tri-Nations rivals. They also enter Sunday's quarter-final at Wellington Regional Stadium with three successive victories against the Springboks in the bank. Deans, however, insists the World Cup is a different stage with different demands. "All that matters is Sunday. The winner goes on, the loser goes home," he said. "Taking comfort from previous games is the quickest path way to the airport. The knock out phases of the World Cup are completely different to every other type of rugby we play - the stakes are higher, the intensity greater and the margins between success and failure smaller. "We've seen that to some extent already in the tournament through the key pool matches and you can pretty much guarantee that it will only intensify from here. History will be created this weekend and we desperately want our piece of it. There's no tomorrow, unless you create one for yourself." South Africa's last World Cup defeat was by Australia in the 2003 quarter-finals and Deans insists the defending champions are adept at prevailing in pressure-cooker situations. "South Africa still have the core group from the last World Cup together," he said. "They know what it takes to be successful in knockout rugby and know how to close out the tight games. "They've already shown that in this tournament when they came from behind to beat Wales by a point. They have a group which has the knowledge and belief that it can get things done. "They will bring that mentality forward with them on Sunday. If we are going to earn the right to advance to the next round, we have to match it." The Wallabies have been strengthened by the return of full-back Kurtley Beale and winger Digby Ioane. Beale and Ioane have recovered from respective hamstring and thumb injuries, enabling Deans to re-select all but one of the XV that opened the tournament against Italy. Pat McCabe, who has been in the treatment room with a shoulder problem, is selected at inside centre with Berrick Barnes dropping to the bench. James O'Connor switches to the right wing with Ioane replacing Radike Samo in the number 11 jersey. Samo is restored to his preferred position of No.8. Samo's return to the back of the scrum is one of five changes to the pack that helped demolish Russia 68-22. Flanker Rocky Elsom, second row Dan Vickerman, tighthead Ben Alexander and loosehead Sekope Kepu are all reinstated. "We've gone with the players and the combinations, which have served us best through the year to date," said Deans. "Obviously injury and managing individual player work-loads has been a factor in selection through the tournament so far, but fortunately a lot of the injury problems that we've had are now behind us. "The players that are coming back into the team after breaks are good to go."